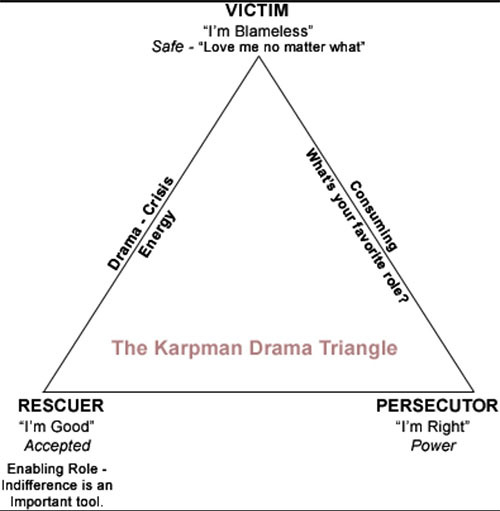 The drama triangle was created by Dr. Stephen Karpman back in 1968. I love the simplicity of it. Whenever you recognize there is drama going on in your life, take a step back and observe it. Which position on the triangle are you playing? The perpetrator, the rescuer or the victim? The perpetrator has a need to be right and prove everyone else wrong. He or she talks down to people, name-calling and yelling. Verbal, mental, emotional and of course physical abuse all fall under the drama of the perpetrator. You can recognize when you are playing the part of the perpetrator when you feel above someone else and or have a need to make them less than you outwardly or even in your own mind. 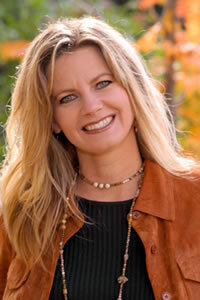 The perpetrator is created from a child feeling power by bullying others. He may feel weak in other areas of his life such as academics, or friendships, therefore he uses his size and aggression to empower himself. He gets rewarded for this behavior and thus uses it throughout his life to compensate for other areas of perceived weakness. The Rescuer, also known as the enabler has a need to fix people. She sees others as broken and has a need to repair them. You know you fall under this category when you feel taken advantage of, unappreciated and over-spent. You’ll notice doing for others what they can do for themselves. Note here… There is a difference of serving others and rescuing others. It’s all about your come from, or the attitude that you are coming from when you do the actions. If you are doing for others out of love in your heart without having an expectation or attachment to the outcome, this is called service. However, if you are pleasing others so that you can feel needed, valued, and Important, or are wanting acknowledgment or something in return, this is a pattern of codependency, enabling and rescuing and will create drama for you and the one you are rescuing. If you fall under this category, you may have learned as a child that you received love and attention by taking care of others such as your siblings or even your parents. You became the caregiver at a very young age and received love and attention for it, therefore it is what your are programmed to do as an adult. The victim shows up in life as one who is always lacking time, relationships, health, and/or money, or all of the above. This person lets you know they are in lack and are in need of help. If you fall under this category you may notice yourself whining and complaining about life a lot. You may see yourself as incapable and therefore need others to rescue you. The victim doesn’t know how to be empowered to feel love, but rathe r has learned to receive love by being inadequate and incapable. When one or more of these parts is being played in the drama triangle, they will need another to be on the receiving end of the drama being played out. For example the perpetrator needs the victim, the victim needs the rescuer to fix her as well as the perpetrator to abuse her to justify that she is the victim. The rescuer needs a victim and or a perpetrator to fix. Many times we will fall into one roll and then move to another one so quickly, we don’t even realize what is taking place. The best way to know when you are falling under one of these positions is to be very aware of how much drama is taking place in your life at all times so that you may correct the behavior.